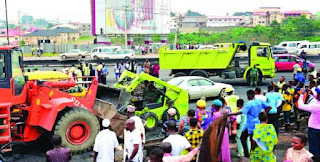 One of the injured victims of the tanker fire accident at the Otedola Bridge, Lagos end of the Lagos Ibadan Expressway died on Friday. SUNDAY PUNCH learnt that the victim, who sustained 90 per cent burns, died late Friday at the Lagos State University Teaching Hospital Annex, Gbagada. It had been reported that no fewer than nine people lost their lives as 54 vehicles were consumed by the inferno on Thursday after the tanker had a crash and emptied its content on the road. Vehicles trailing the tanker were reportedly trapped and burnt by the fire, which raged for a few hours before it was put out by firefighters from the Lagos State Fire Service. The Chief Medical Director of LASUTH, Prof. Wale Oke, told our correspondent on Saturday that seven burn victims were admitted to the hospital and its annex at the Gbagada General Hospital. He said while one of the victims was dead, medical personnel were recording progress on the treatment of the other six persons. Oke said, “We had seven burn victims. Five were admitted to the Burns and Trauma Unit, Gbagada, while two were admitted to LASUTH, Ikeja. “One out of the two victims at LASUTH has been discharged because his burns were not much. The other one has 40 per cent burns and he is still in the ward responding slowly to treatment. Oke said the government had started making plans to use the state forensic lab to identify the burnt bodies. One of the key rescue management workers said relatives of some of the dead victims had started making contact with the Lagos State Emergency Management Agency. She explained that the agency was considering setting up a help desk for people whose relatives might have been involved in the incident. Oke added, “I can say that most of the people who died in the fire were not the occupants of the vehicles because when we searched all the vehicles, none of them had a single corpse. Most of the people who died were passersby and I was even told one of them was a policeman. “We recovered two of the bodies in a gutter and three by the roadside. Most of the occupants of the vehicles escaped on sighting the fuel pouring on the road. We have no reason to reduce the number of casualties. We cannot take the bodies away without bagging them. The fatality figure is nine. The number of injured may have been more because some of the survivors could have left the scene to treat themselves. The source said the 54 burnt vehicles were handed over to officials of the Lagos State Traffic Management Authority, adding that they were reduced to scraps by the fire. SUNDAY PUNCH gathered that the tanker driver fled immediately the incident happened and had yet to be found. It was also learnt that the owners of the tanker could not be identified as it was not registered. 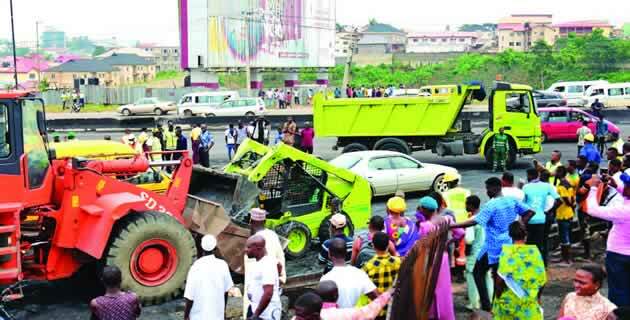 Some residents, artisans and business operators around the Otedola area, venue of the disaster have expressed their worries and fears over the persistent crashes that usually resulted in loss of lives and property. They told SUNDAY PUNCH correspondents who visited the area on Saturday that they had yet to recover from the trauma of the tanker fire explosion that occurred on Thursday evening. Some residents, who spoke with our correspondents, narrated their ordeal and how they are still experiencing shock over the unfortunate development, especially when they actually saw people burning inside their own vehicles, without any help. They said their fears stemmed out of the fact that they could have been victims of the same incident if the fire had extended into their estate. A resident, who simply identified himself as Tare, said he was not at home when the incident occurred. He nevertheless said he was yet to recover from the shock. Another resident, Patience Joseph, who had a shop in front of her house, said that she was in the shop when she heard the explosion and fled. She said, “I was sitting in the shop when I heard the sound of the explosion, I immediately ran inside my house. I immediately ran outside again looking for how to escape. “Despite the distance from the fire, the heat could kill and that was why most of us evacuated from our homes at that moment. The heat was affecting our skin as if we were inside the fire. A tricycle operator, Segun Ayo, said the heat of the fire affected him because he was still close to the gate of the estate, when the tanker exploded. “The heat from the fire was something else; I am still rubbing something on my hand. I am very happy that I was not caught up by the fire. Sometimes, the scene of the incident still flashes in my mind and I can’t but fear. “I believe some people died as a result of the smoke because the smoke was so thick that the rescue workers had to give us nose-guards to prevent us from inhaling terrible odour,” Ayo added. A security agent at the Otedola Estate, Mr. Attahi Simon, said the fire started at 5:20 pm while he was controlling traffic into the estate. Simon siad, “I wasn’t so close to see what exactly happened but I think the brake failed because I saw the motor-boy that was with the tanker waving at cars to stop when the tanker started reversing as it could not ascend the hills. “While the tanker driver was trying to take control of the vehicle and prevent an accident because there was traffic jam, the vehicle fell and I think the explosion occurred. 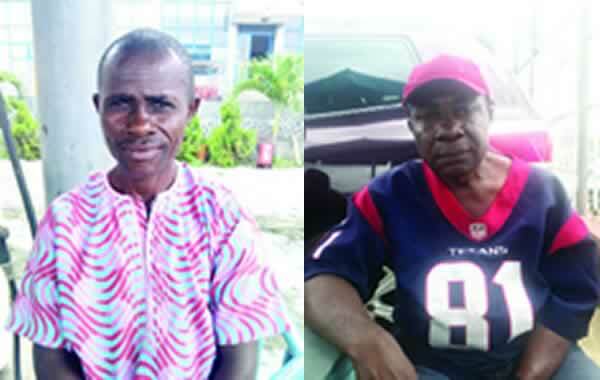 “By the time, the tanker fell, I went inside the estate; I was at the second gate when we heard the sound of the explosion. The first thing I did was to run away. While talking to our correspondents about the security measure he took to forestall the situations, he said they left the main gate open for everyone. He said, “We left the gate opened for people to escape down to Olowoira area while I watched the fire from a distance as it subsided. Another Security agent at Omole Phase II who pleaded anonymity told SUNDAY PUNCH that immediately they saw the fire he and his colleagues fled for their dear lives. When SUNDAY PUNCH inquired from him why they locked the gate against people who were running to escape from the inferno, the security man said his boss took the initiative to do so. He said, “I later learnt that it was the Chief Security Officer who locked the gate. He is not around at the moment; he would have had a better explanation for doing so. Nobody was thinking straight at that point. I guess he did what he believed was right at that moment.